Ringing in the New Year is one of the few holiday celebrations that is marked in nearly every country in the world. International New Year’s festivities may look remarkably similar on television, with large crowds of people gathered in central locations in countries around the globe. However, many countries also have their own unique and sometimes offbeat traditions to welcome in the New Year. Below is a list of how people celebrate in nations across the globe. Russia: One New Year’s custom in Russia is to write a wish for the upcoming year on a piece of paper, then to burn the paper and place the ashes in a glass of champagne, which needs to be consumed right before the New Year is rung in for the wish to come true. Peru: Peruvian New Year’s traditions are a dime a dozen, with everything from wearing new clothes and lighting candles to writing down wishes, all practiced with the intention of bringing good luck for the upcoming year. One of the most interesting of these is the tradition of foretelling the next year’s fortunes with the use of potatoes. According to the tradition, three potatoes are placed under a chair or sofa-- one peeled, one half peeled and one unpeeled. At midnight, one potato is chosen at random, which forecasts the state of next year’s finances, with the peeled potato signifying no money, half-peeled a regular year and unpeeled a great financial bounty in the year ahead. Philippines: Another country where New Year’s traditions outnumber the months of the year, the Philippines has a number of rituals designed to bring good luck in the year ahead. One of these is to open all doors and windows in your house on New Year’s Eve in order to allow negative energy to leave and good energy to enter. South Africa: Throwing furniture out of windows has become a tradition in the South African city of Johannesburg-- one that local authorities have been keen to stamp out in the face of rising pedestrian injuries. A police crackdown on the practice was nearly successful in eliminating it last New Year’s-- though rising rents in the city may have also had something to do with curbing the expensive tradition. Spain: Spanish tradition holds that eating 12 grapes just before the clock chimes midnight will bring good fortune for all 12 months of the upcoming year. The custom often sparks a contest of who can cram the grapes into their mouth fastest. Puerto Rico: In Puerto Rico, traditions involving water are prominent around the new year. One custom holds that throwing a cup or bucket of water out of the window on New Year’s will help to drive away the evil spirits. Another way of keeping those spirits at bay at the turn of the year involves falling backward into waves as the clock strikes 12. Ireland: New Year's Day, which is known as the Day of the Buttered Bread in Gaelic, is traditionally marked in Ireland by banging loaves of bread on doors and walls to chase the bad luck out of a house and to invite good spirits in. 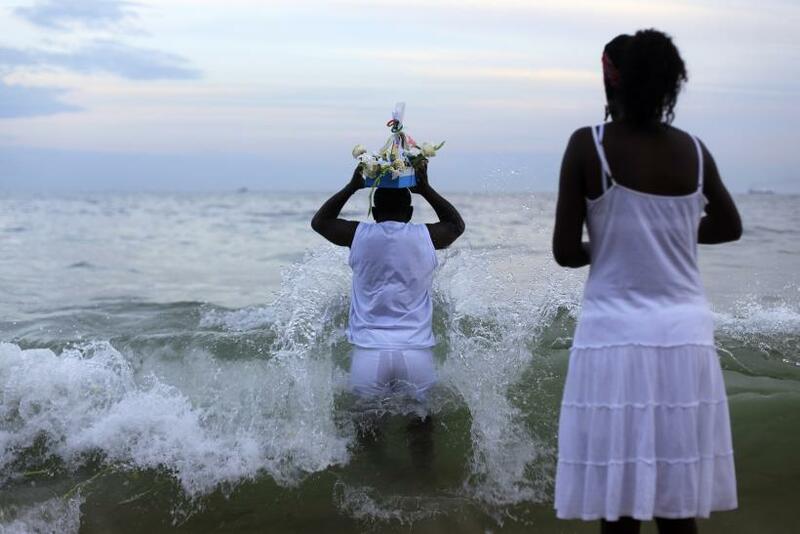 Brazil: Brazilians might be known for ringing in the New Year on Rio de Janeiro’s Copacabana Beach, but another major component of the celebration in the country is the practice of wearing white. The tradition of wearing white clothing is, like many other New Year’s traditions around the world, meant to bring good luck for the upcoming year. This is often accompanied by a trip to the beach to throw flowers in the sea while making a wish.